I LOVE beets and have since I was a little girl. No one had to bribe me to eat sugar in its natural form. In fact, my mom says I thought beets were dessert until someone in first grade told me I was a nutbar for thinking such things. The possibility that I’m a nutbar does exist, but I was right about the beets. They’re on my list of seasonal super foods for a variety of reasons. 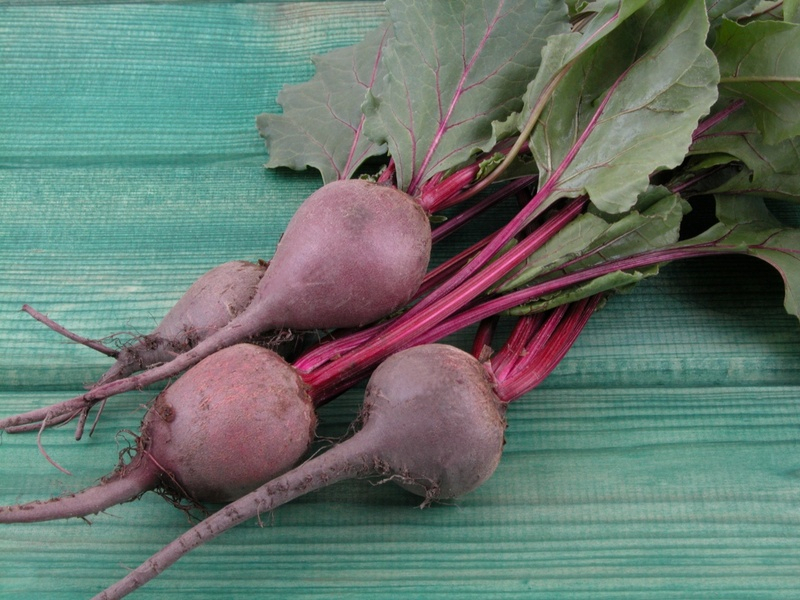 Betacyanin is the pigment that is responsible for the crimson color of red beets. Betaxanthin is the pigment found in yellow and orange beets. Both are powerful phytonutrients (protective antioxidants). Studies show beets to be protective against free radical damage and may inhibit the formation of cancer cells. The high fiber in beets helps lower cholesterol and triglyceride levels and increase HDL levels, which are all good things when it comes to heart health. Beets are high in folate, vitamin C, magnesium, phosphorus, iron, and even the sleep-inducing nutrient, tryptophan. If that’s not enough to convince you to add beets to your shopping cart, they’re also incredibly low in calories. * If you’ve been following this blog, you’ve probably figured out that I like the science behind the food and that often brings some offbeat information into my blog posts. Like why your pee smells weird if you eat too much asparagus. Or why curvy women score higher on cognitive tests. So, I couldn’t resist adding some strange beet science to this post. Beeturia is a condition in which your pee or poop takes on a lovely red or pink color if you eat a lot of beets. Don’t worry, it’s harmless and actually a good way to test your food transit time. Yeah, I know — that sounds rather icky-poo, but in the digestive-health big picture, that’s important information. You don’t want the stuff you eat to be sitting around in your gut for days on end. But you also don’t want it rushing through your system before you have a chance to break things down into usable building blocks. So the bottom line is, if you eat a bunch of beets, you’ll probably be able to gauge how long it takes for them to make their chemical voyage through your GI tract. Some research indicates that excessive red color in the urine after eating beets may indicate an iron deficiency, but don’t panic if your pee is pink. It’s probably not a big deal. * Beets are also high in oxalates, which are organic acids that may cause problems in people with certain rare health conditions. For most of us, that’s nothing to worry about. Guess what? The government has decided that almonds deserve a special nut status. Wonder if I might qualify? The FDA has approved almonds, pecans, pistachios, walnuts, hazelnuts, and peanuts as having QHC (qualified health claim) status. This allows them to carry the following claim on the packaging label: Scientific evidence suggests but does not prove that eating 1.5 ounces per day of most nuts, as part of a diet low in saturated fat and cholesterol, may reduce the risk of heart disease. And no, almonds dipped in rich dark chocolate don’t qualify. But almonds are full of health-promoting nutrients like vitamin E, magnesium, phosphorus, B vitamins, and copper. They also promote good digestive health because they are full of dietary fiber. Studies indicate that people who eat healthy nuts and nut butters have a lower risk of developing gallstones. My favorite snack is Fuji apple slices dipped in almond butter. Yum! This aromatic salad green is also known as rocket, roquette, rucola, and rugula. Low (practically none) in calories and high in vitamins A and C, this is a good one to mix in with other greens for a tasty salad. Gourmetsleuth.com has a wonderful beet and arugula recipe that makes for a perfect seasonal side salad. Check it out. Celery, parsley, coriander, dill and fennel are part of the Umbellifereae family. Not that you’ll remember that, but do keep in mind that fennel is an excellent source of vitamin C, potassium, folate, and dietary fiber. Fennel also contains a potent phytonutrient called anethole which acts as an antioxidant and an anti-inflammatory agent. Aside from all the healthy reasons to eat fennel, it smells wonderful and adds a delicate aroma and subtle licorice-like taste to all kinds of fresh salads. Fennel is easy to confuse with anise — although in the same family, they are different plants. This entry was posted on Wednesday, July 9th, 2008 at 8:40 am	and is filed under Gluten-Free Recipes, Nutrition Therapy, Seasonal Foods. You can follow any responses to this entry through the RSS 2.0 feed. You can leave a response, or trackback from your own site. I’ve never liked beets before, so I will have to give them another try…I’ll let you know how it goes My favorite sanck is Fujis with peanut butter too! How ’bout that! Hey girls – yes, love those beets! They’re SO good for us. Raw or roasted. Yum! I’m going to be out of town (in the wilderness – yippee) for the next 10 days, so I won’t be able to check my comments. I’ll okay any waiting for approval when I return. I LOVE beets too! My Mom makes an awesome Lithuanian beet soup that’s cold and SO good. I’m going to get that recipe from her and convert it dairy-free so I can still enjoy it. Thanks for the great info, Melissa! Melissa, I’m really loving your season foods series. We’re pretty crazy about beets too and tried to grow 4 varieties. But they take sooo long to grow and get big, so we just get ours at the farmers market. Luckily in our area, beets are available year round. Oh I just read your comment…are you going backpacking? Can’t wait to hear your stories! I am so glad that I came across your blog (through Milk for the Morning Cake). I love the mix of science and food. Look forward to reading more posts. Hi all – I’m back from part 1 of an adventure I’m on. I’ll post about it as soon as I recover enough to think straight. Lizzie – I’m really curious as to what Lithuanian beet soup is. Let us know one of these days! WORC – Your garden photos look amazing. So, beets or no beets, whatever you’re growing has to be wonderful. And, yes, about the backpacking. I’ll explain soon. Menehune – nice to “meet” you. Glad you left a comment as it was fun to check out your blog. The “impromptu summer stew” looks yummy. The beets in your photo are SO BIG! I’m jealous! I pulled a couple from my garden, just to see if I could enjoy some baby beets. No! Mine are still infants. I’ve got chigoggia beets this year. They have the Target logo inside. Can’t wait to see a full grown one. Some friends made me oven roasted baby beets last summer. They were sweet like fruit. Just peel and bake on a cookie sheet until tender. Then serve with a dallop of goat cheese and some toasted walnuts. Easy and fabulous! Kay – I don’t have a garden and am growing nothing bigger than a pot of herbs. The beets I’m getting are from my local CSA (Grant Family Organic Farms). Your oven roasted beets with goat cheese and toasted walnuts sounds amazing. I have so many beets right now that I will try that tonight. Yum! Thanks for the idea. Thanks for reminding me to buy more beets! I had almost an entire bunch of roasted ones and completely neglected the quinoa I’d made to go with the beets. Now I need to go find some yellow and orange-ish beets.